Welcome to our new and improved magazine. 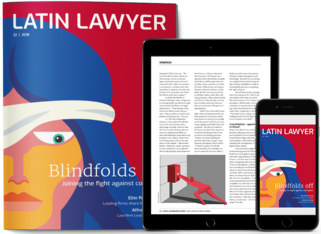 As most of our content is read online, Latin Lawyer’s editorial strategy is increasingly digitally-led. That’s why we have upgraded our website and enhanced the online functionality of the Latin Lawyer 250. But this prompts the question of what place a print magazine has in a virtual world? We’ve concluded there is still room for a physical product and that its value lies in high-quality design as well as good articles. While we continue to publish material for our website daily, the magazine will now be produced quarterly and contain thought-provoking content that is pleasing to the eye. To kick things off, where better to focus than one of the most talked about, highly-sensitive issues in the legal market today: the role the legal profession should play in the fight against corruption. The companies undergoing investigations for wrongdoing are clients of multiple law firms. Are they doing enough to know their customers? It is our belief that the print edition should provide in-depth analysis of key issues affecting our readers, which is why we have sought the opinions of top practitioners on the legislation that seeks to curb Peru’s corruption problem and a new competition law in Argentina. Also in this edition, we profile Latin Lawyer’s Elite firms of 2018 and find out how their leaders are planning for the future. The outgoing leader of one such firm is Latin Lawyer’s Law Firm Leader of the Year; Alfredo O’Farrell reflects on his time at the helm of Argentina’s largest firm, Marval, O’Farrell & Mairal. In recent years, corruption has come to dominate the agenda in Latin America. As the list of companies under investigation grows, has the legal profession been complicit, and can law firms play a greater role in the fight against bribery? Allende & Brea partner Julián Peña and associate Federico Rossi discuss the proposed reforms to Argentina’s competition policy, which have been made possible by the Macri government’s decision to prioritise sound competition law enforcement. When Odebrecht admitted to paying bribes of US$29.5 million related to infrastructure projects in Peru, the country’s government swiftly enacted a decree to secure damages and keep infrastructure work ongoing. Having failed to achieve either, it has enacted a new law that stands to be more effective. Rodrigo, Elías & Medrano Abogados partner Fernando Molina takes stock. The poster child of the Macri administration, the RenovAr renewables programme is the first major example of his government using state policy to successfully drive private investment into Argentina. But a big funding gap, infrastructure deficiencies and an energy market in its infancy mean Macri has his work cut out for him. Like many Argentine lawyers of his generation, Marval, O’Farrell & Mairal’s Alfredo O’Farrell knows how to take advantage of a boom and weather a bust, but few have leveraged fortune and catastrophe with quite such good results. We speak to this year’s winner of Latin Lawyer’s Law Firm Leader of the Year award. An investigation into bribery allegations related to the supply of monitors in Brazil could not have come at a worse time for Bilfinger. The German engineering and service company was already managing the fallout of an FCPA investigation into historic corruption in Nigeria and had just uncovered irregularities in a contract between the Brazilian navy and one of its subsidiaries. Throw in high turnover in its leadership and compliance teams and a succession of profit warnings, and the future was not looking bright. But a new GC helped get the company back on track.